Inter boss Luciano Spalletti sympathised with Jose Mourinho's emotional reaction to Manchester United's dramatic win at Juventus, saying "if you tease a lion, sooner or later it will roar". Mourinho has faced intense scrutiny over United's form this season, but saw his side fight back against Bournemouth in the Premier League last weekend before producing a hugely impressive turnaround against Juve on Wednesday. United were trailing to Cristiano Ronaldo's stunning opener with four minutes remaining, only for Juan Mata's expert free-kick and Leonardo Bonucci's own goal to seal three points in the Champions League Group H encounter. Following the full-time whistle, Mourinho entered the Allianz Stadium pitch and cupped his ear towards the home crowd, who he claims had been taunting him due to his time in charge of rivals Inter. 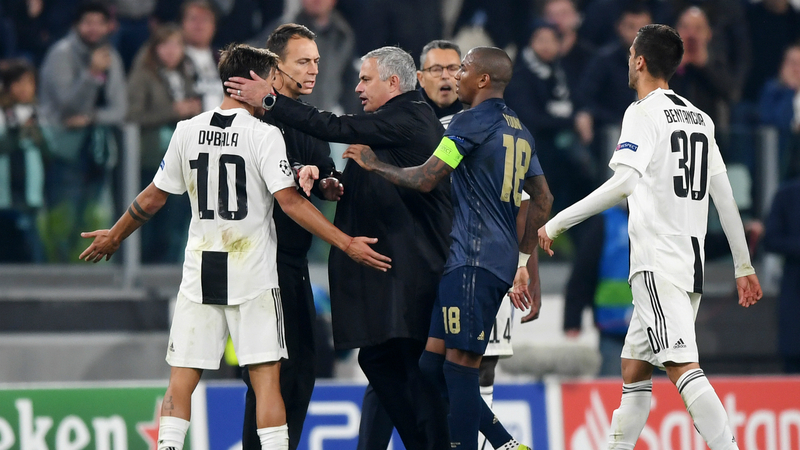 The incident sparked a reaction from the home players and current Nerazzurri coach Spalletti concedes Mourinho should probably have shown more restraint, but understands his actions. "I believe that he himself said after the match that he wouldn't have done it again. I think we all agree on that," he told a news conference ahead of Inter's Serie A trip to Atalanta. "However, there is a lot of pressure, especially in certain matches and that starts to build. There is always the scope to react because I do the same job as him and I'm fully aware of that. "However, I believe that as long as it goes no further than that, it's all part of the show. Clearly if you tease a lion, sooner or later it will roar. These things can happen." It was put to Spalletti, whose side trail Juve by six points in Serie A, that the Bianconeri's defeat could be proof that Massimiliano Allegri's side are not as strong as first thought. But Spalletti rejected such claims and insists Juve are still the benchmark in Italy. "I really believe that they are better than everyone else and they will probably be the team that wins the league," he added. "However, there are difficulties throughout the course of a league season which could undermine their ability. Therefore all of the other teams must be flawless and they really must try to achieve the impossible. "Individuals have often achieved the impossible with the conviction that they can change the world with a moment of time based on their mental strength and character. "The ability to believe and never give up. The capacity to keep going and to always develop I won't give up until the final whistle blows in the 95th minute." Inter took a big step towards the Champions League knockout stages with a fine 1-1 draw at home to Barcelona on Tuesday, but the result came at a price with Radja Nainggolan set to miss out on Sunday with a recurrence of an ankle injury. "Nainggolan tried to do what we are accustomed to seeing from him. He made himself available and he produced a good performance based on what he was capable of doing," he said. "However, he has taken a step back with regards to his fitness in terms of the injury he was carrying. I think it's unlikely he will be involved, nevertheless we should also credit him for wanting to be involved in the match."